While not the traditional time of year, it’s been holiday season for Kev and Jono… clearly making the most of having pre-school age children while they can and avoiding the expensive times of year. It has, however, meant that this brew has been overshadowed by some very poor planning. In April, Ross (@brewstore) had wisely given Homebrew Society members two months’ notice that June would be low ABV month, but both Kev and Jono were away so missed that and only heard about the mission a month later. Having worked through the dates in a somewhat panicked state, it was clear that there wouldn’t be a time that they would both be in the city for long enough to put a brew on together. So, Kev was in the hotseat but happened to be away at that point so rushed through a grain order and – yet again – ordered the wrong stuff. He really shouldn’t be allowed to do things unsupervised. So, after shamefacedly going back to Brewstore again for Lager and Munich malts (yep, that’s right, he forgot a whole two thirds of the ingredients! ), Kev was good to go for his first ever solo brew. All factors seemed to be pointing to a low ABV wheat beer, hopped more heavily than style would typically suggest. Kev had already been eyeing up similar beers being brewed by @Lugsy51 and @AdyGoodrich. His thinking was that it should (hopefully) be a beer style that could handle being sub 3.5% and that would also be ready quickly. The next society meeting was in less than a month, after all. Anyway, the recipe was influenced by wheat beer recipes / guidance from Randy Mosher’s Radical Brewing, @apthomebrewer’s blog and @Lugsy51. Special thanks to the latter for looking over the recipe and offering advice. I will update with progress, tasting notes, etc. in due course. A few observations on the brewday. With it being such a low ABV beer, it was mashed at a higher temperature than usual (69-70C) to try and get some more body in there. It’ll be interesting to see what the final gravity is after that, but I guess it will finish high. Hopefully not too high as it also ended up a couple of points short of intended OG… while low ABV is the point of this of course, no one wants it too low! 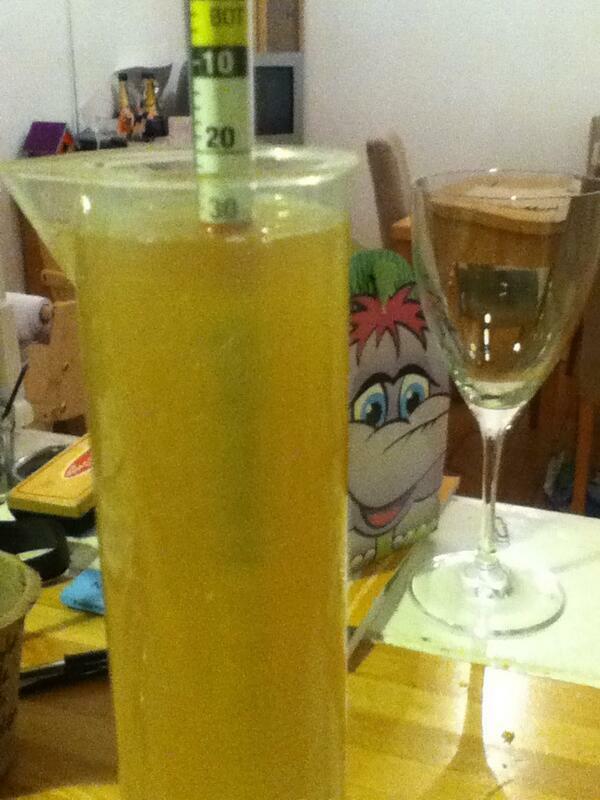 There was some great news in that the mash held temperature this time (only dropping 0.7C across 60 minutes). No extra insulation, the blanket and duvet around the pan were just given a right good tucking. It was the first use of first wort hopping, rather than a 60 minute addition, in one of our beers so it’ll be interesting to see how that turns out. It was also Kev’s first exposure to this Experimental Hop 366 that has been getting so much attention of late. It did, to be fair, smell pretty amazing and the Kernel IPA made with 366 that was drunk while boiling was super. So, excited about trying it. All in all, it was a pretty smooth first attempt at brewing solo. Jono was missed, and you’re definitely kept a lot busier cleaning and preparing for the next stage when your on your own, but it’s good to know it’s very possible to do. It should help keep production levels high and, as a result, beer stocks healthy. Working and concentrating hard did, however, mean that photography took a bit of a backseat, but the rather patchy picture below should give an idea of colour, clarity and quite how low the hydrometer dropped. Thanks for reading. Any and all comments welcome. Cheers! This entry was posted in Uncategorized and tagged Bavarian Wheat, BIAB, Experimental Hop 366, Hallertau, Hefeweizen, homebrew, Low ABV, Mangrove Jack on May 17, 2014 by bagboilbeer.